Sri Sarada Devi (1853-1920) was the wife of Sri Ramakrishna. During the lifetime of Ramakrishna, Sarada Devi’s modesty meant she kept a very low profile. But she was a great spiritual personality herself and she came to play an important role in leading the Ramakrishna movement after the death of Ramakrishna. At the very early age of 5, according tothecultural tradition of the time,she was betrothed to her husband Sri Ramakrishna. At the time Sri Ramakrishna was going through his intense period of sadhana. So intense many of his family thought he was losing his mind. They thought that marriage would help bring his mind back to the worldly realm. However in the marriage to Sarada Devi, Ramakrishna saw the hand of the Divine Mother and so agreed to the proposal. Sarada Devi didn’t go to live with her husband until the age of 18. She had been hearing rumours about the madness of her husband and so felt a sense of duty to go and visit him in Calcutta. Thus she set off walking almost 60 miles to Dakshineswar where she met Sri Ramakrishna. On meeting Ramakrishna she was relieved to know the rumours about Ramakrishna were baseless- her husband was a genuine spiritual man, who exuded not only kindness, but also often went into spiritual ecstasies. From 1872 Sarada Devi lived at Dakshineswar as a devoted wife and the first disciple of her husband Sri Ramakrishna. Their marriage was celibate and unconventional. For Sarada Devi it was a period of intense spiritual practise and service to her husband, Ramakrishna. Her life revolved around devotional practises, cooking and looking after the needs of Ramakrishna and his disciples. Ramakrishna had a very delicate constitution and struggled to eat food from the temple. Therefore Sarada Devi would cook with the utmost care so as to be able to feed Ramakrishna. Her life was a very simple and, characterised by humility, modesty and a loving spiritual disposition. At the time she observed the practise of purdah. (veiling of body) and was rarely seen by other male disciples of Sri Ramakrishna. Thus they were not fully aware of her spiritual realisation until after his passing. Sarada Devi often prayed to see people without any faults. She later said that seeing faults in people doesn’t help them but hinders your own progress. A significant event took place when Sarada Devi had been living with Sri Ramakrishna for about a year. Sri Ramakrishna had undergone intense spiritual disciplines. He practised spiritual disciplines from many religions and spiritual traditions. However his principle deity was Kali, the Divine Mother. 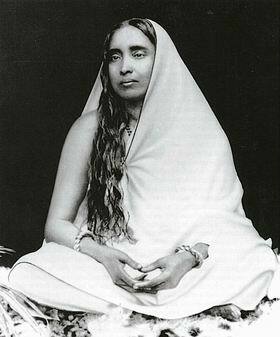 On one occasion of worshipping the Divine Mother he asked Sarada Devi to sit in the seat of the Divine Mother. Thus Ramakrishna completed the Shodasi Puja (worship of the Divine Mother) with Sarada Devi taking the place of the Divine Mother. Both attained a very deep spiritual consciousness in which Sarada Devi became identified with the spiritual devotion of Ramakrishna and became absorbed in the consciousness of the Divine Mother. What are you doing? I have not gone away, I have only passed from one room to another. This vision greatly helped her and contrary to Hindu tradition she continued to wear a red-bordered Sari and ornaments. She was later criticised for doing this but she felt no reason to mark the death of Ramakrishna in the usual way. After the passing of Ramakrishna, Sarada Devi went on a pilgrimage to Vrindavan, a place associated with the life of Sri Krishna. Here she had frequent ecstasies and profound experiences. However despite her elevated spiritual consciousness her outer life proved to be quite difficult. When she returned to her family home she was treated badly by some of her family members. In particular one of her brothers died prematurely leaving behind his wife and daughter, both of whom suffered from temporary insanity. Sarada Devi coped with Surabala and later Surabala’s daughter Radhu with utmost patience and forbearance, never criticising fate or seeking to avoid her responsibilities. However after a while the disciples of Ramakrishna came to know of her suffering and so arranged a place for her to stay. Alsoafter a while shebecame to be respected as a Guru in her own right. Sarada Devi had participated in the Sadhana of Ramakrishna and through the Shadosi Puja had become one with his spiritual realisation.Swami Vivekananda always held Sarada Devi in the highest regard. Before making his momentous journey to America in 1893 he sought her blessings and guidance -blessings she gladly gave. Sarada Devi thus began to initiate many seekers into the Ramakrishna order. When her fame started to spread the number of disciples seeking initiation began to increase significantly. Unlike Ramakrishna, Sarada Devi was not picky about which disciples she accepted. Her motherly heart did not want to reject anybody who came for spiritual initiation. It is also said she took on the sins of her disciples and her body suffered as a consequence. She also used to get up at 2am so that she could do sadhana, not for her benefit, but for the disciples she had accepted and whom she looked upon as a son or daughter. After a debilitating illness Sarada Devi passed away on July 1920, her body was taken to Belur Math and cremated. There were over 7,000 well wishers present at her funeral.